Nexpro (Esomeprazole Magnesium) is in the proton pump inhibitor class of medicines. It works on the gastric parietal cell and inhibits the action of the proton pumps in the stomach, thereby stopping the process in which stomach acid is produced. Nexpro (Esomeprazole Magnesium) is in the proton pump inhibitor class of medicines. It works on the gastric parietal cell and inhibits the action of the proton pumps in the stomach, thereby stopping the process in which stomach acid is produced. This leads to a suppression of gastric acid secreted from the stomach. There are a wide range of indications for this medicine, including being administered on a short term basis to promote the healing of erosive oesophagitis and to help maintain the healing process and resolution of symptoms in patients affected by erosive oesophagitis. Some patients may also be given it to reduce the risk of gastric ulcers associated with NSAIDs (medicines used for the relief of pain that may contribute to stomach problems) and it is also commonly taken to eradicate helicobacter pylori (bacteria which can affect the stomach) so as to lower the risk of duodenal ulcers. It may also be used for treating Zollinger-Ellison syndrome. 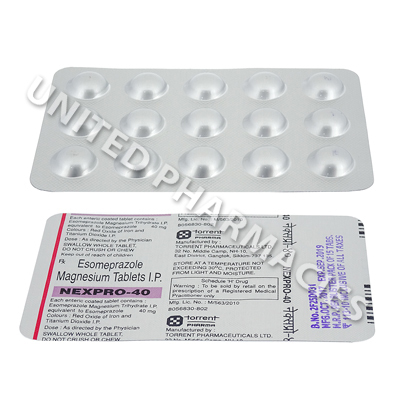 Nexpro (Esomeprazole Magnesium) tablets are administered by mouth. This medicine comes in a 40mg strength formula. Treatment of some conditions may be on a short term basis, however patients using it for the maintenance of healing are usually instructed to take it for longer. Your doctor will decide the required dosage based on the condition you are treating. Adults undergoing treatment for a helicobacter pylori infection may be told to take 40mg per day for a period of 10 days alongside antibiotic medicines. Zollinger Ellison syndrome is normally treated with 40mg taken twice per day. Erosive oesophagitis, gastroesophageal reflux disease, gastric ulcers caused by NSAIDs and other conditions may require a different dosage. Never take more than your doctor tells you. Ensure that your doctor is informed if any reactions or bothersome side effects occur during treatment. Other reactions which have not been mentioned here may also occur. If you experience any dangerous or severely harmful side effects, immediate medical treatment will be needed. This can include seizures, bloody diarrhoea, muscular twitches and other reactions not listed here. This medicine is a proton pump inhibitor. Medicines in this class have been associated with a possible increased bone fracture risk. Certain patients with individual risk factors may be more likely to be affected by this. Ask your doctor about this before starting treatment. Inform your doctor if you have a history of liver problems. 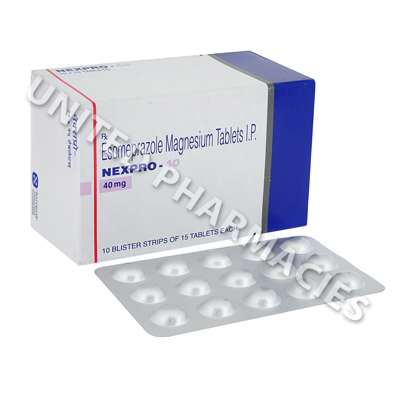 Always use Nexpro (Esomeprazole Magnesium) as you have been prescribed by your doctor. Never self-medicate or change your dosage without first consulting your doctor. The correct dosage can vary depending on your health, medical history, and the severity of the condition being treated.